The fastening system W 30 HH is able to overcome any challenge in heavy haul traffic and allows a safe driving even under extreme climatic conditions, with temperatures between – 60 and + 50 degrees Celsius. 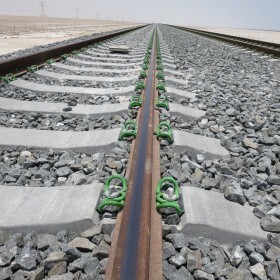 Further, this system offers an optional abrasion plate (AP) as a protection against the abrasion of rail seat and rail pad. Up to now, the system W 30 HH has been installed on approx. 700 km heavy haul tracks.